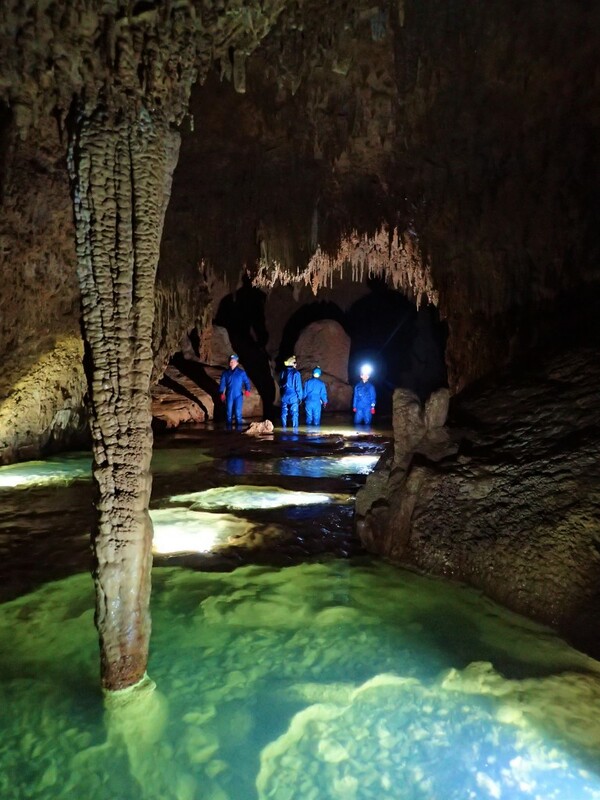 Exciting Caving Tour in Okinoerabu Island, Kagoshima, Japan | Kagoshima Love! Okinoerabu Island is located at the southeast of Japan’s mainlands. 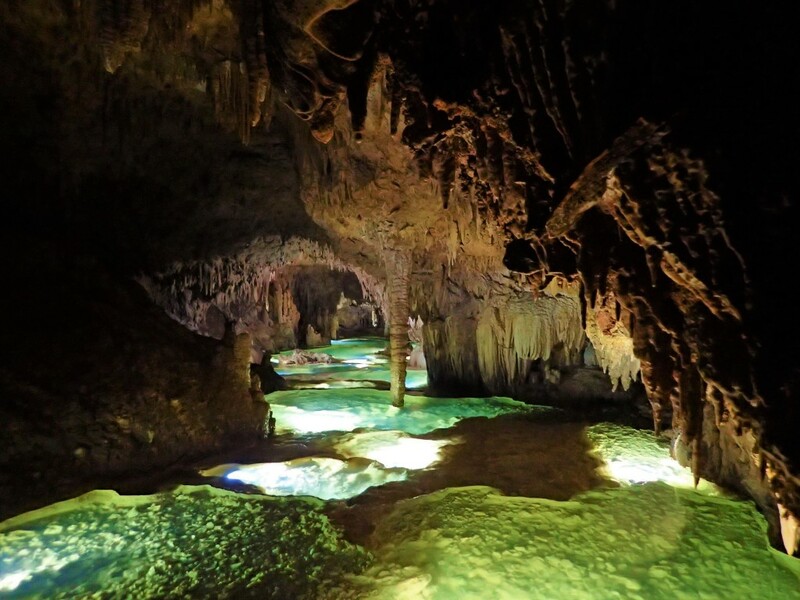 It takes 1hour and 10 minutes from Kagoshima Airport by airplane or 7 hours from Naha Port, Okinawa Prefecture by ferry. 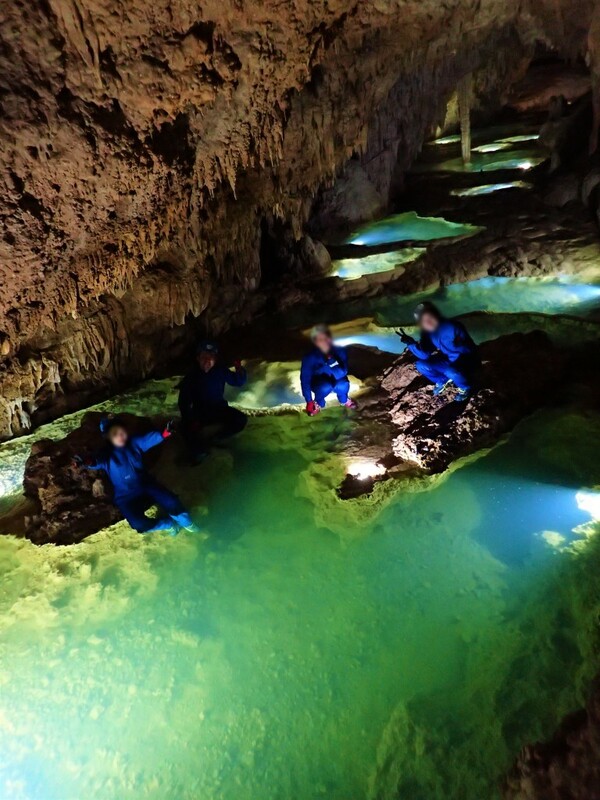 I joined the caving tour at Okinoerabu Island. The beauty created by the nature is very impressive! 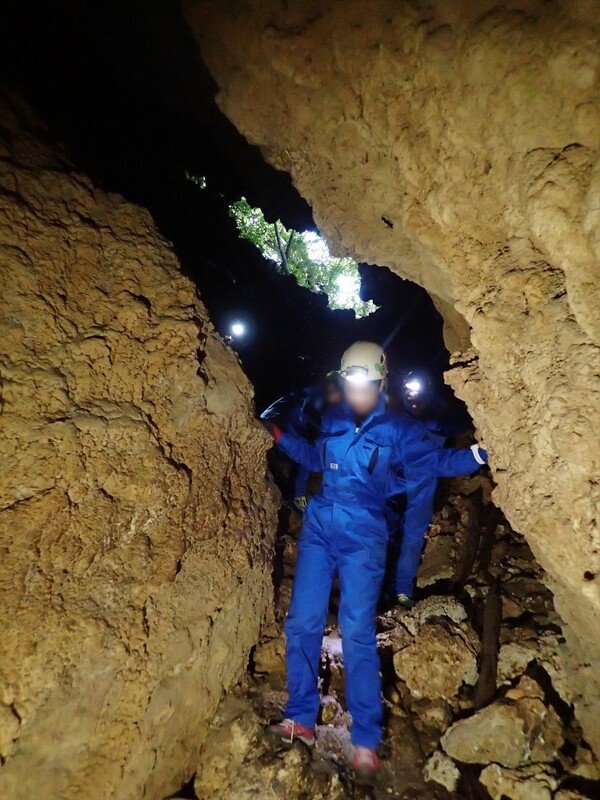 I decided to participate in caving tour of Okinoerabu Island. 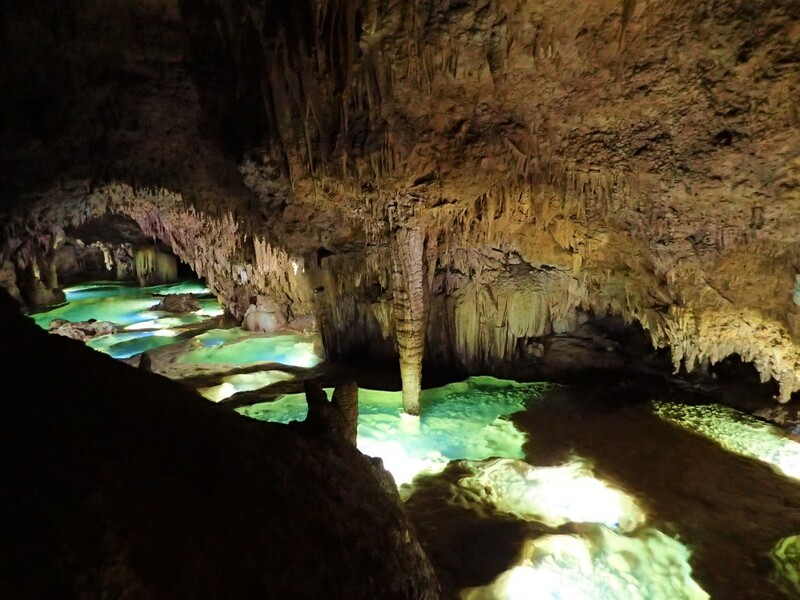 I was impressed by the beautiful cave of the island and this is why I decided to do it. But I am not good as physical exercise. That was my anxiety. Maybe I would be injured in the cave? 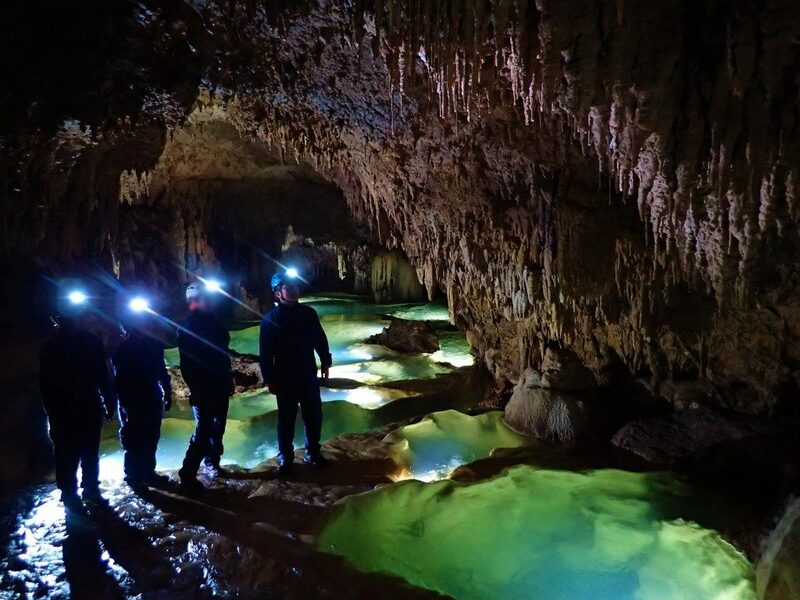 If I miss the opportunity, I won’t challenge caving forever. 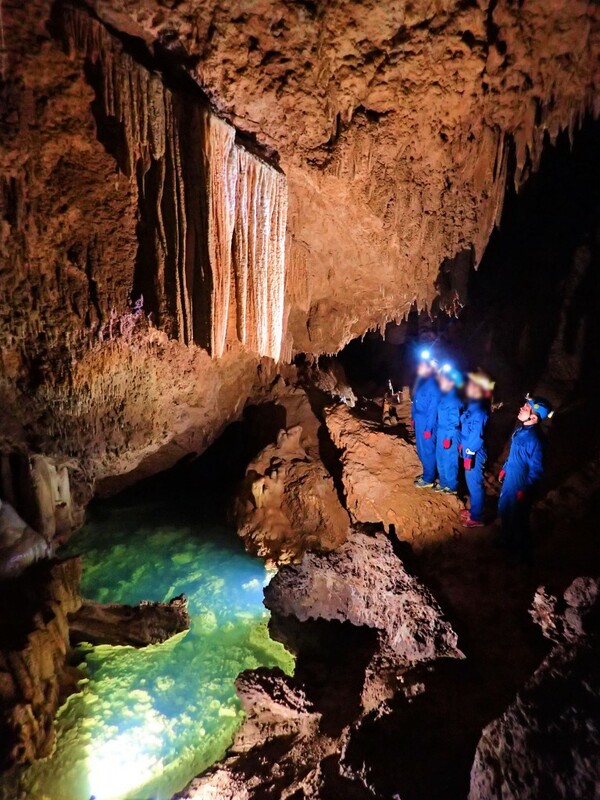 I e-mailed Okinoerabu Island Caving to book the caving tour. The fee of the tour is 16,000 yen including insurance. You can rent a wet suit and shoes for additional 1,500 yen. The staff picks you up at your hotel. 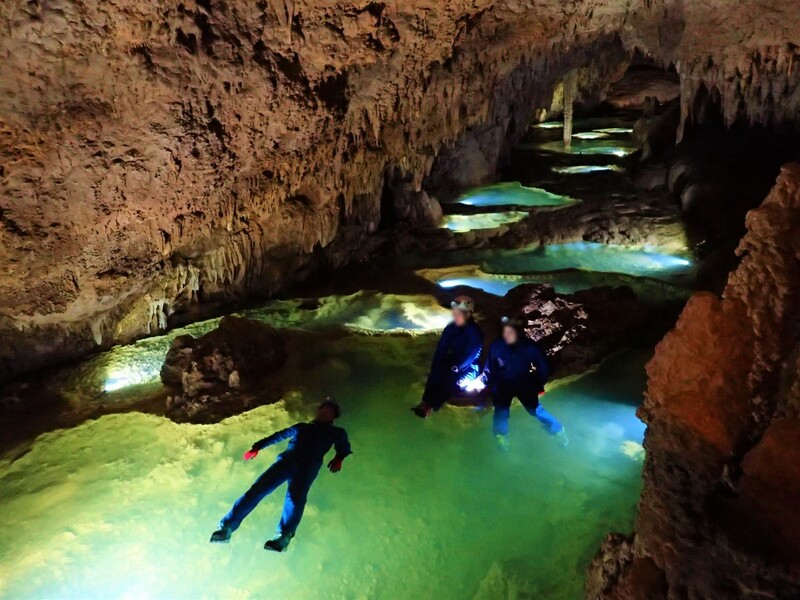 The caving tour office is located near Okinoerabu Furoraru Hotel at the south of Okinoerabu Island. 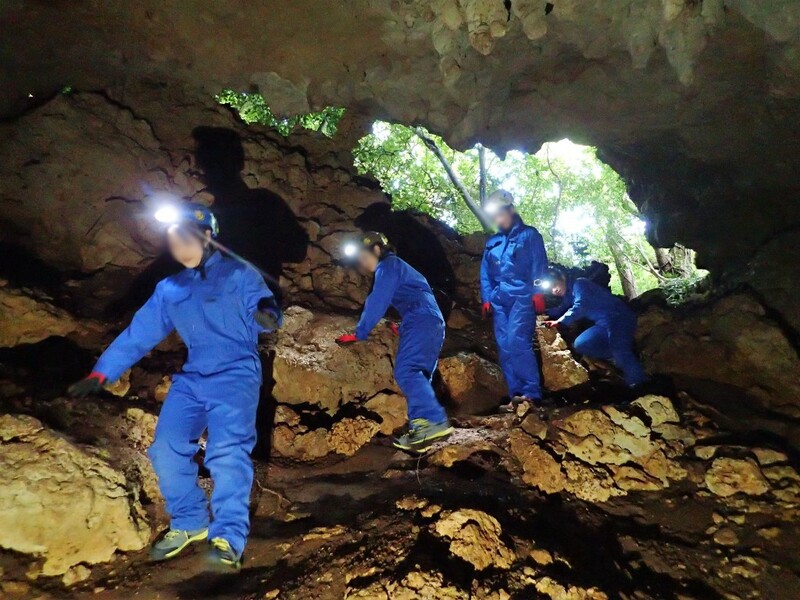 The staff briefly explains the caves of Okinoerabu Island. I paid fee by credit card. 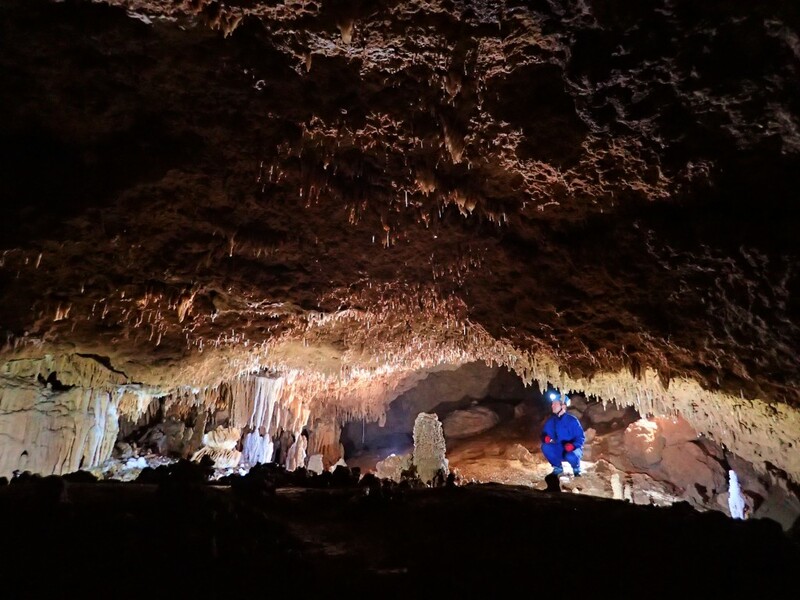 The guide takes photos for you when you explore in the cave. The guide put photos in DVD and send it to your hotel. You can also take photo by yourself but it must be water proof. Other tour participants were young girls who enjoy graduation trip of university. It is wise to take swim suits before you participate in the tour. We put sweat suits and work clothes. It is hot and a bit heavy. We also put on the helmet with a small light. Guide took us to the entrance of cave for 10 minutes by car. After getting off the car, we walked mountanous trail for 5 minutes and arrived at the entrance. My face is scared in front of the cave. The road is wet and slippery. I could hear water was flowing in a distance. We found a white cave stone near the entrance. The mad was on surface. 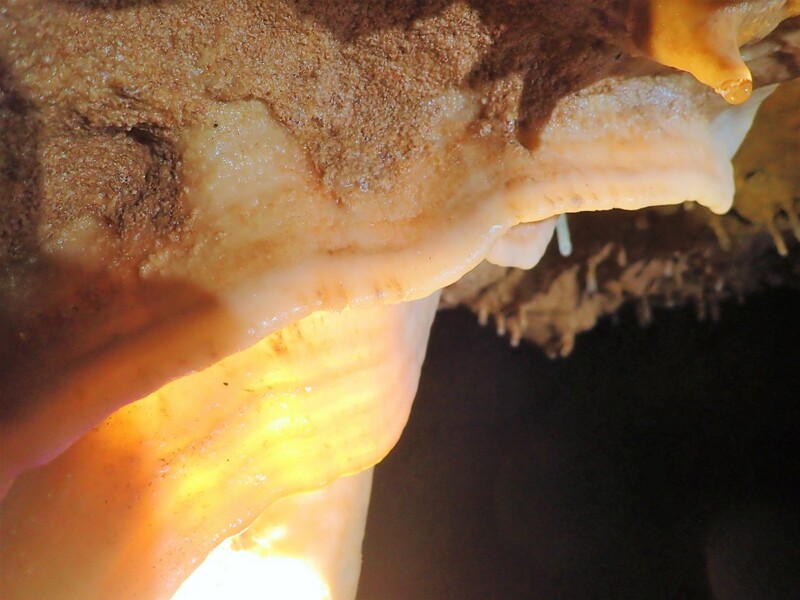 In the past, the cave was open for public and many people touch the white stone with muddy hand. That is why the stone got dirty. 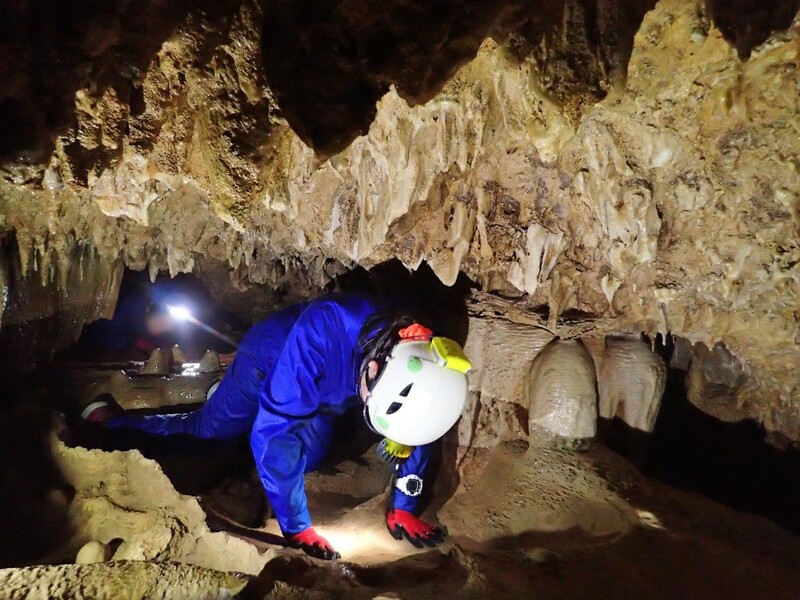 Recently those guide association administers the cave to preserve the environment of the cave. 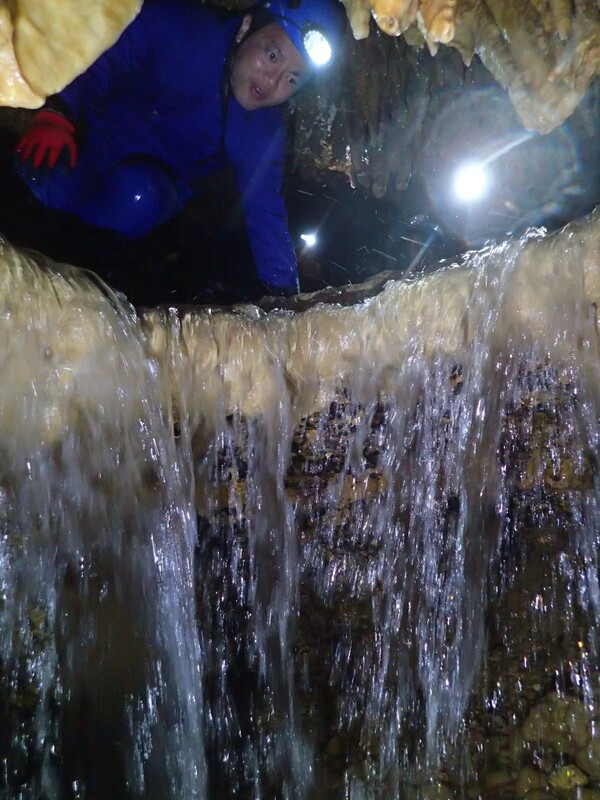 Water is flowing at many places in the cave. 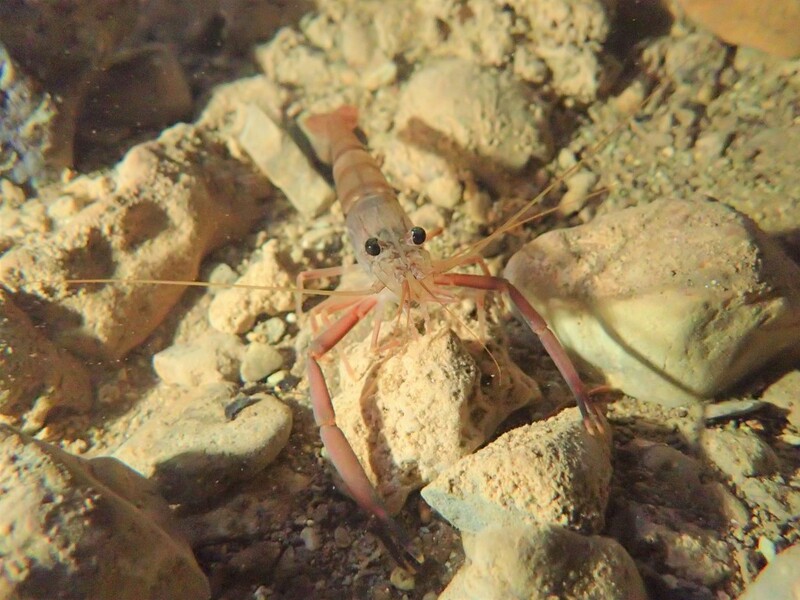 We found a small cute shrimp in the water. Water is a bit cold, but wet suit keeps your body warm. We found many unique stone in the cave. I went through a narrow place. Water is transparent and very clean. At the following picture a water is dropping from the rock. 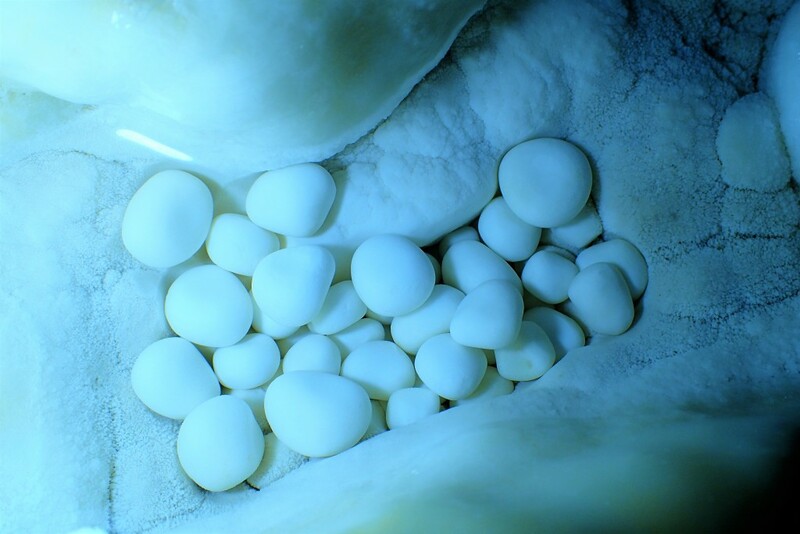 It takws about 20 years for the straw-shape rock to grow 1 cm. The rock looks like a bee nest. The above rock is turned out to be the fossil of coral. 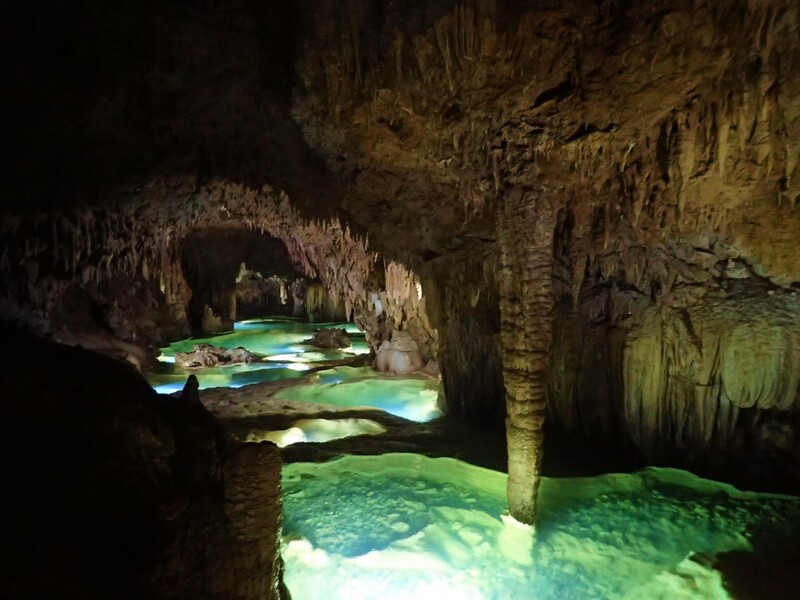 It follows that this place was under sea in the past. What do you think those rocks are? 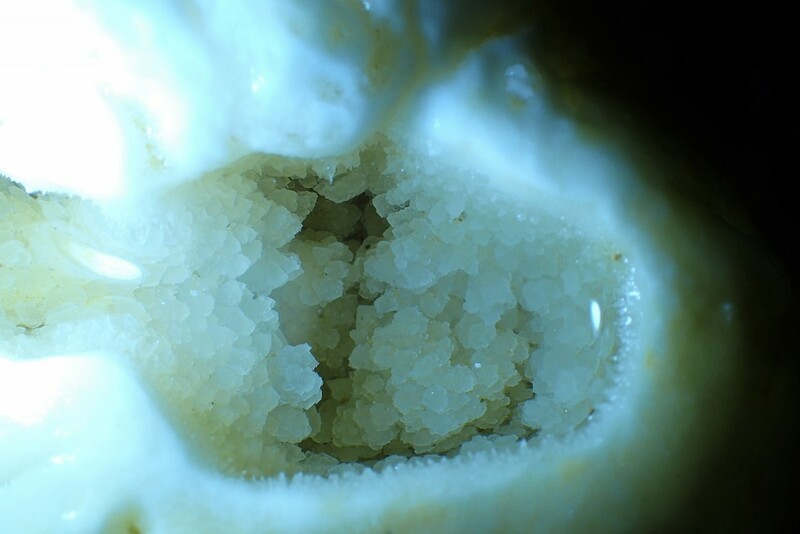 Those stones are called Cave Pearl. When water drops to the floor, the crystalization occurs around the sand and grows slowly. 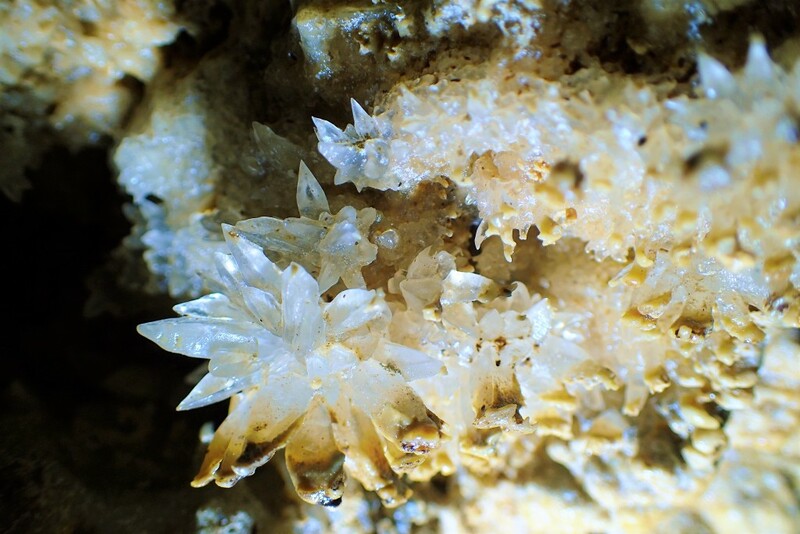 I found a beautiful crystal in the cave. Guide took a very nice picture for me. Guide told us to turn off light. It was completely dark and we could see nothing. We could hear only the flowing water. It was very scary but exciting. The stone pillar is several times as tall as my body. This stone is called curtain. 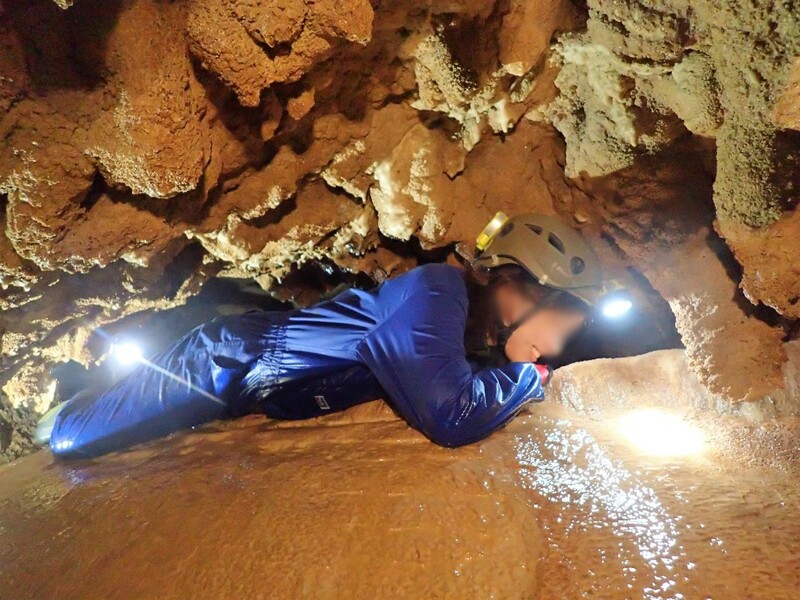 You maybe think that caving is the hard excercise. 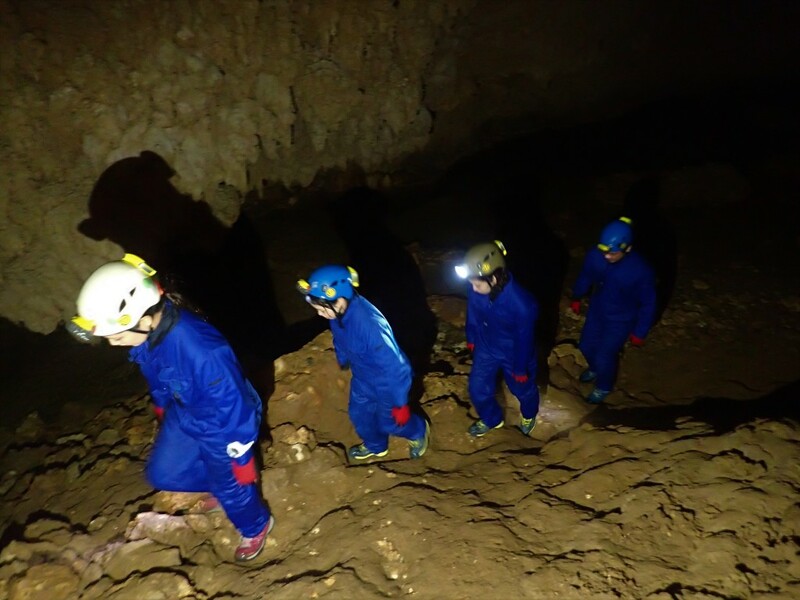 But young girls can enjoy caving. 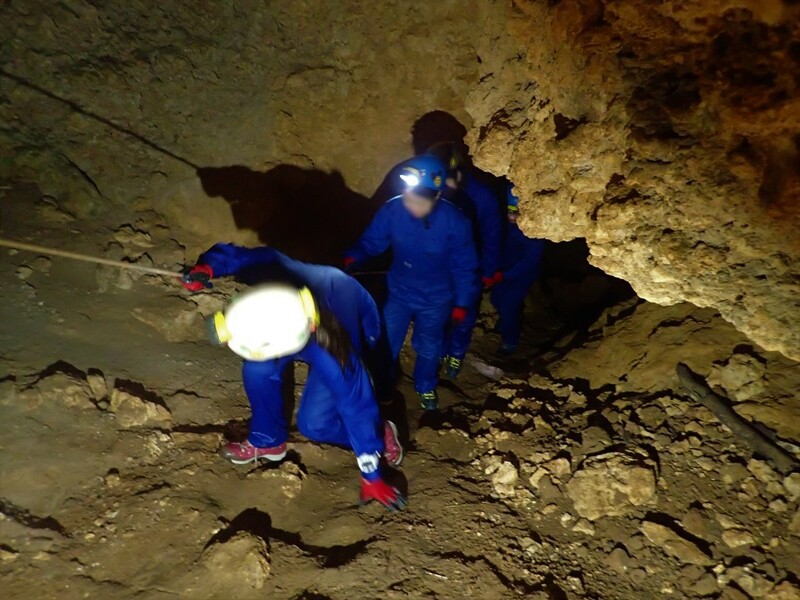 I hope many people join caving tour even if they are not confident in excersize. We crawl on the rock on which water is flowing. Even young lady can do it, so do I! I got throught the narrow place. I slided over the surface of the rock and kept floating on the water. I am not good at swimming but wet suit helps me float. 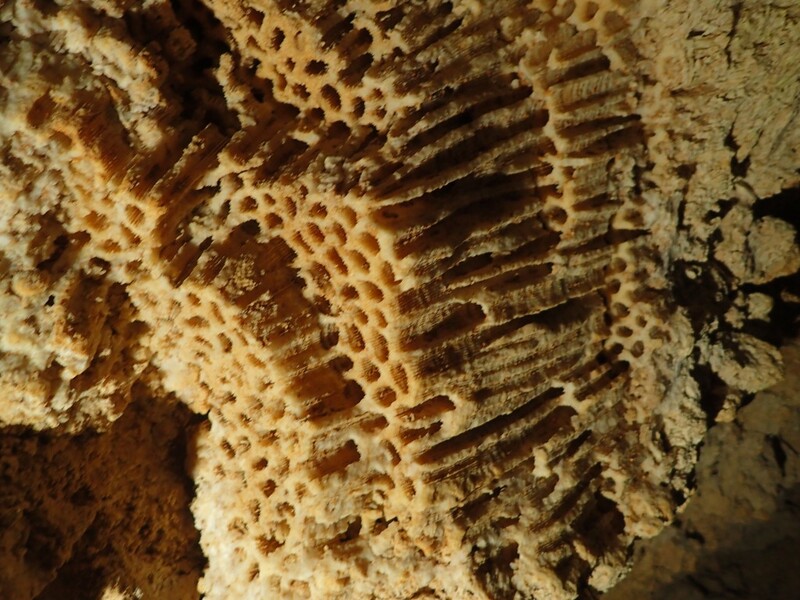 It is fantastic to look over the beautiful ceiling of the cave. Guide gave us coffee and we hat a little break time. Suddenly the guide told us to remain there and disappeared. We wondered where the guide went. The guide came back to us and lead us to a different place. We were at a loss for words for the beauty. 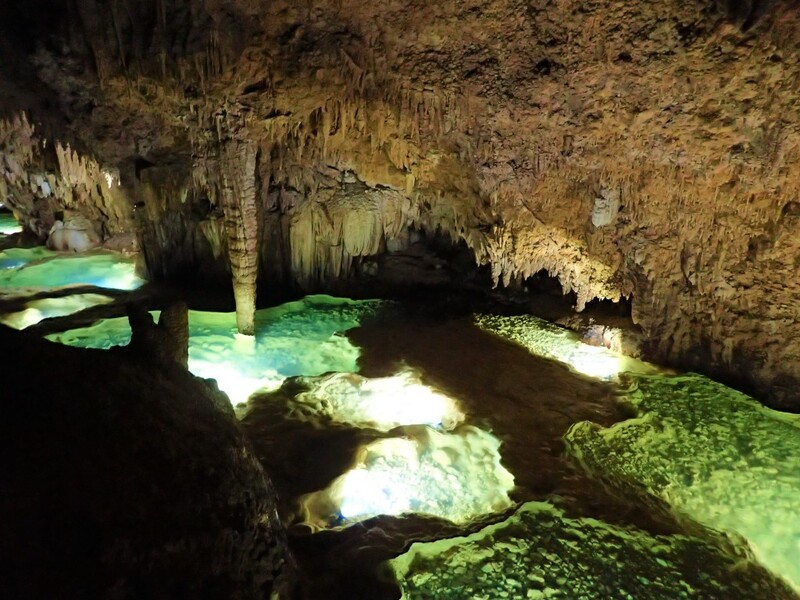 The guide had put the same white light in all lakes, bit each lake produces different colors. I came to Okinoerabu Island to see this view! I felt as if I was in space! I am now jumping into a hole. My face is anxious since it is difficult to estimate the height. We enjoyed floating over water. We came back to the entrance of the cave. It was completely dark when we came back to the car. I took off working suit and wet suit and then the guide took me to my hotel. It was about 20:00 when I was back to the hotel. I was bit tired, but I enjoyed the tour lot! 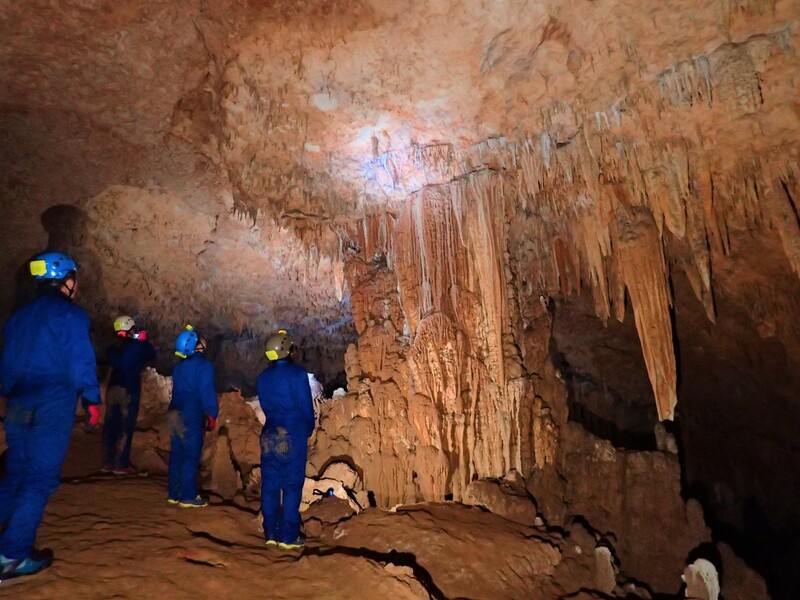 Even if you are not good at excercise, I think that you can enjoy the caving tour very much. 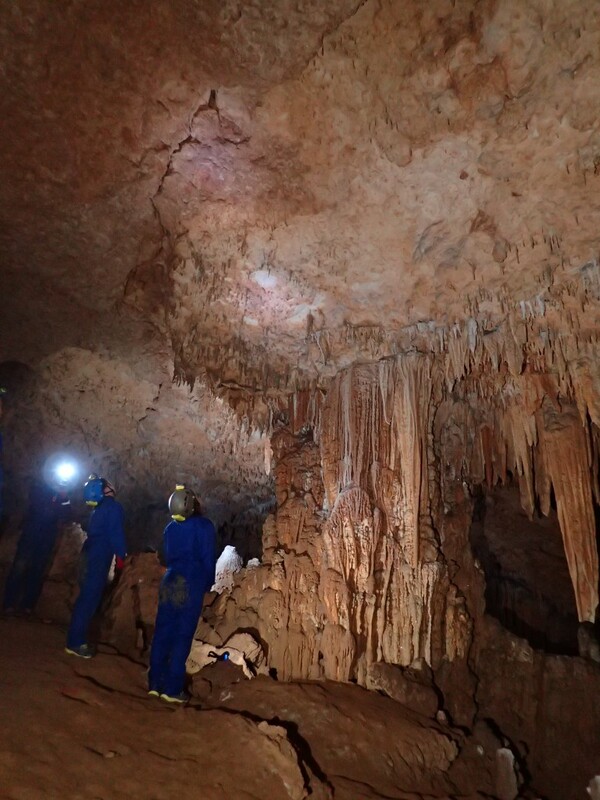 I strongly hope you will also visit the Okinoerabu Island to join the caving tour. 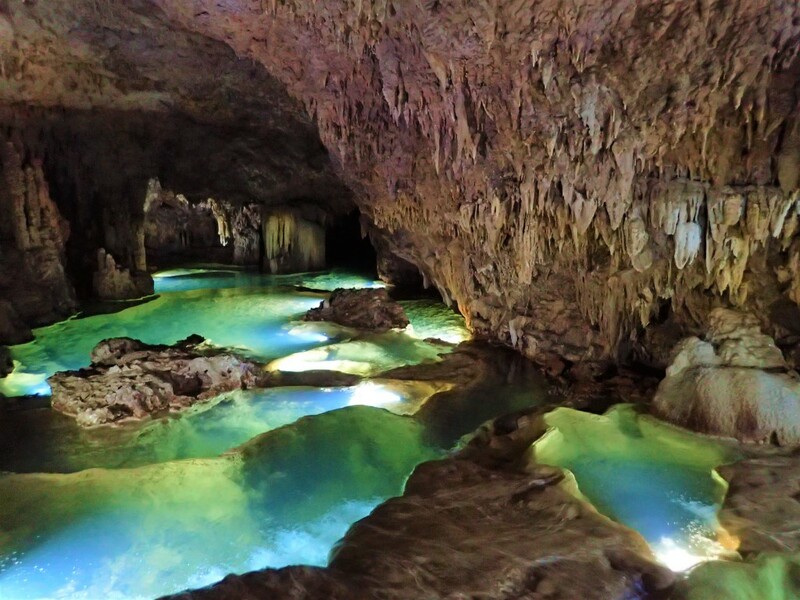 Beautiful cave will captivate your mind. Kagoshima’s Volcanoes getting Active! Enormous Eruption will occur soon…?